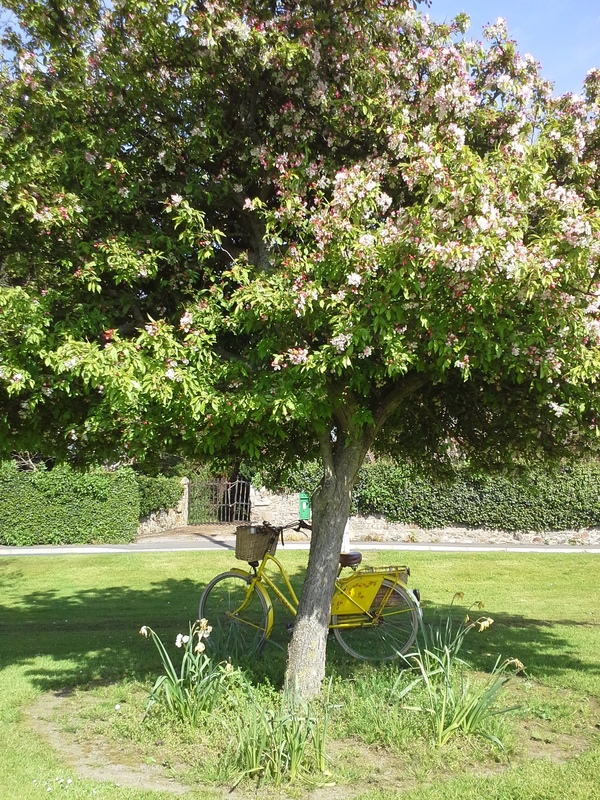 Life under a chestnut tree. Where Victorian ladies bounce and sway and toss their flowery heads’. a fox trots by, unperturbed by my presence. If I stretch out my hand I could touch his rusty coat. My glass of wine turns purple now in the fading light. If its granted I will return to the willow and untie the sapling and leave the willow a small gift….a ribbon maybe. An odd pastime I hear you say. 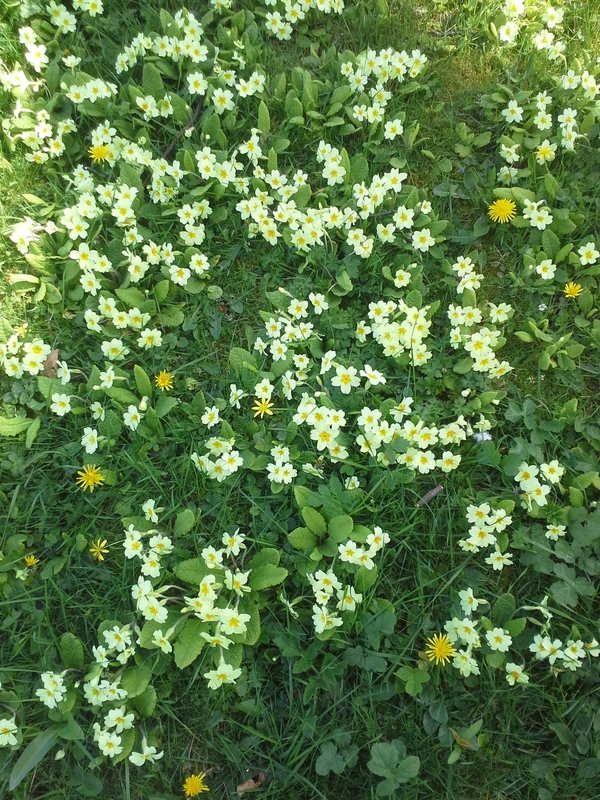 Lie in the grass, for example, with my face pressed against the earth, smelling the tiny herbs, yellow bedstraw, wild thyme, birdsfoot trefoil, harebell. Watching the insects in their miniature world, scurrying about on their daily business. But mostly I lean against tree’s. the Sun peeps over the horizon at about 6 am and the birds are going crazy with love. My thoughts have not yet turned to the sea. 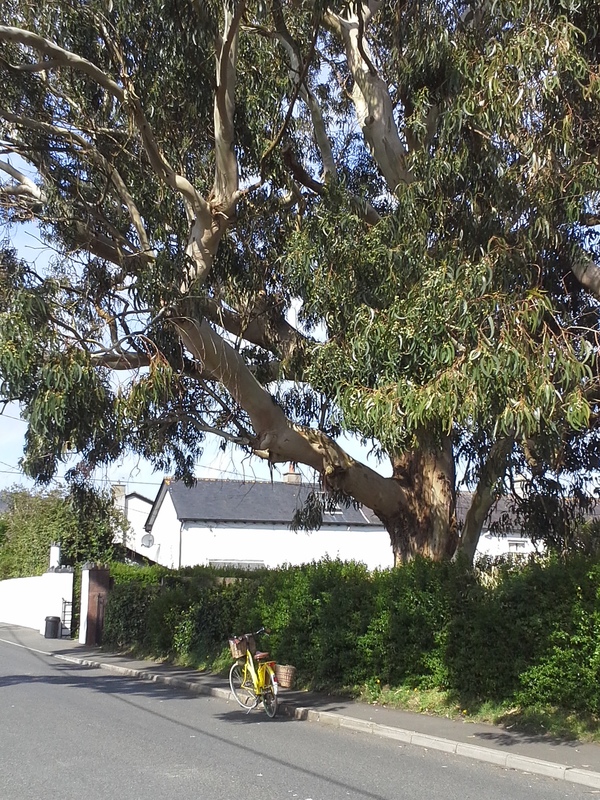 On a recent morning when I was out and about on the yellow bike foraging, I heard their familiar call and following their flight, my eyes shaded against the sun, I noticed the tree’s. 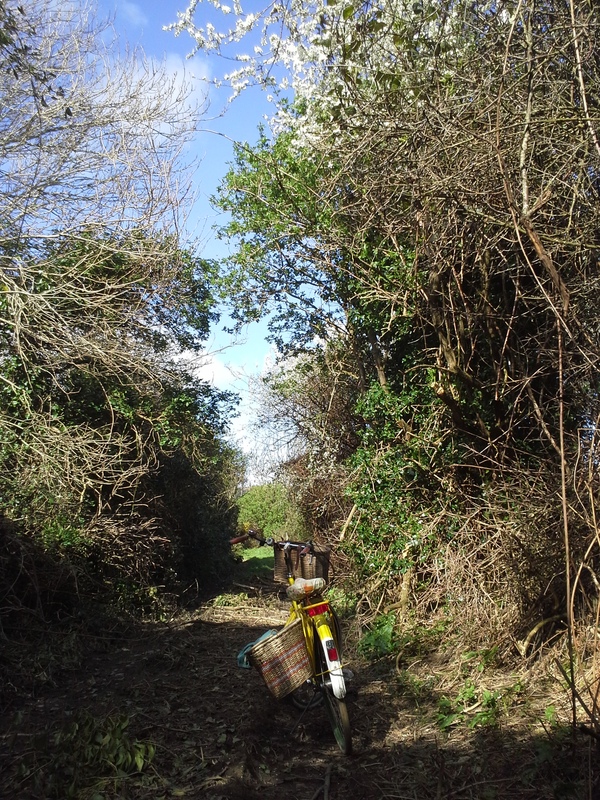 While I was busy with my head down, rooting in the ditches for nettles and goose grass they were coming into leaf. Sway and sigh in the wind. But mostly they are grave and solemn and stalworthy. Standing among them or leaning against them, I am calmed. when I lay my perturbed head against their trunk’s, I swear I can hear them breathe.. They would lie under a tree with a question in their heads and drifting into quiet wondering, the question always in their mind’s and focusing on the wind moving though the leaves they would lie patiently and after a while the answer would come to them. 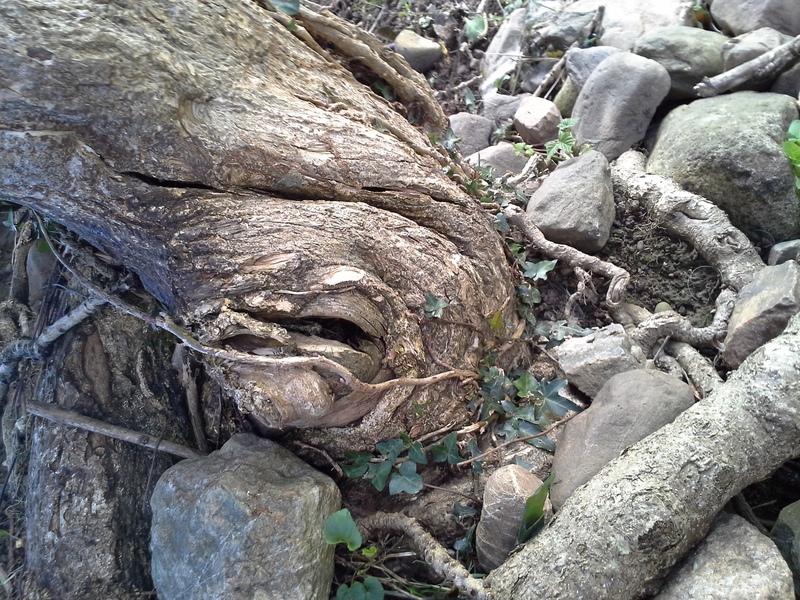 At my Mother’s house there is a wonderful old chestnut tree. I wasn’t allowed to go running for sympathy, for if my parents knew of my fall, the tree house would be seen as a danger and dismantled..
We were loyal to each other my siblings and I and there was an unspoken rule ! The telling of such tales was not allowed as it would spoil the fun for the other more careful climber’s. So I had to put up with my bruised and painful behind and get on with it . This has been more or less my philosophy in life since. I remember a dark side to this tree too, We had a goat, her name was Jinny and we fed her chestnut leaves, lots and lots of them. She blew up like a balloon, keeled over and died. But it would be unfair to blame the chestnut tree for this when It was obviously the greed of the goat. 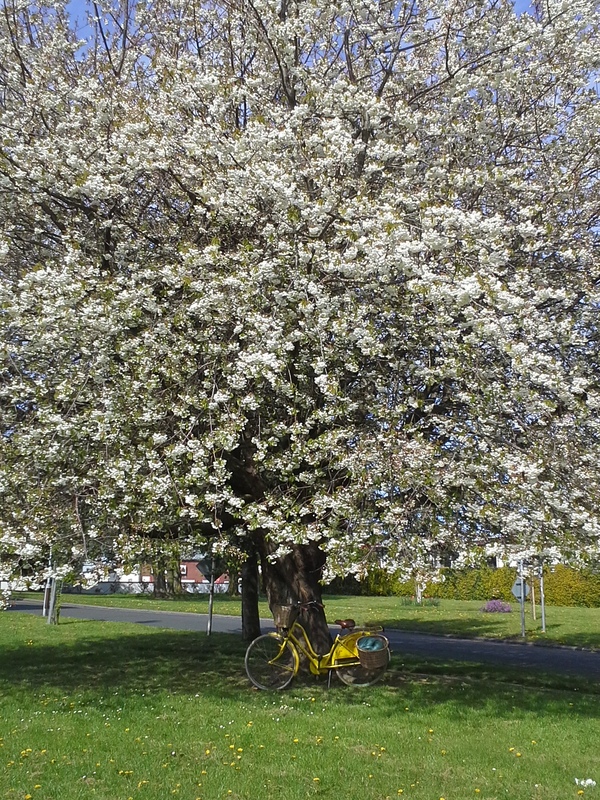 In later years when, through circumstances beyond my control, I lived for a while in my little camper , parked under this very chestnut tree and It became my living room. Placing a picnic table and two canvas chairs I spent many summer evenings after a hectic day at the hospital, sitting under the cool pale green of its leaves, sipping wine and writing. I loved its candles though I felt Victorian ladies, swaying in the wind was a better comparison. My neighbour was a squirrel then, not at all perplexed by my presence and many an evening a fox trotted by so closely I could have lent forward and stroked its red coat. I was happy living there . 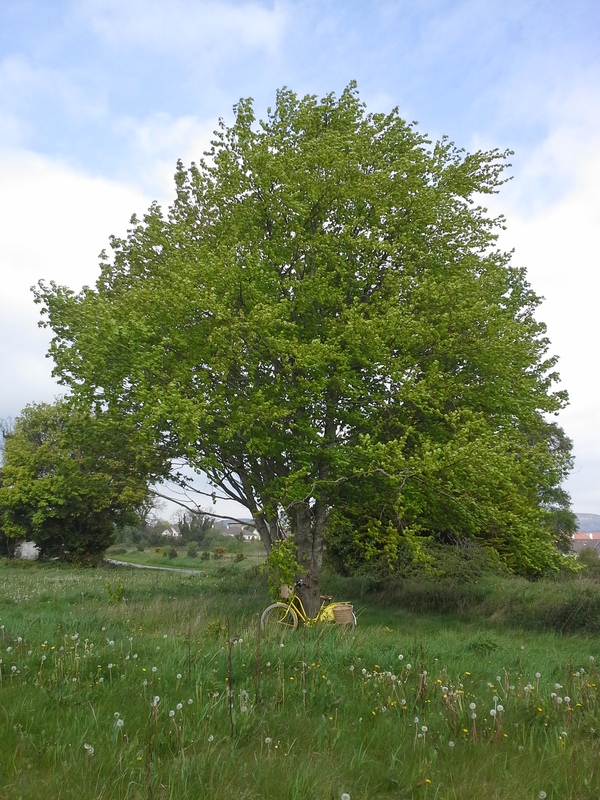 But the chestnut tree is not a native of Ireland, and therefore does not grow within the ancient list of Sacred Celtic tree’s. 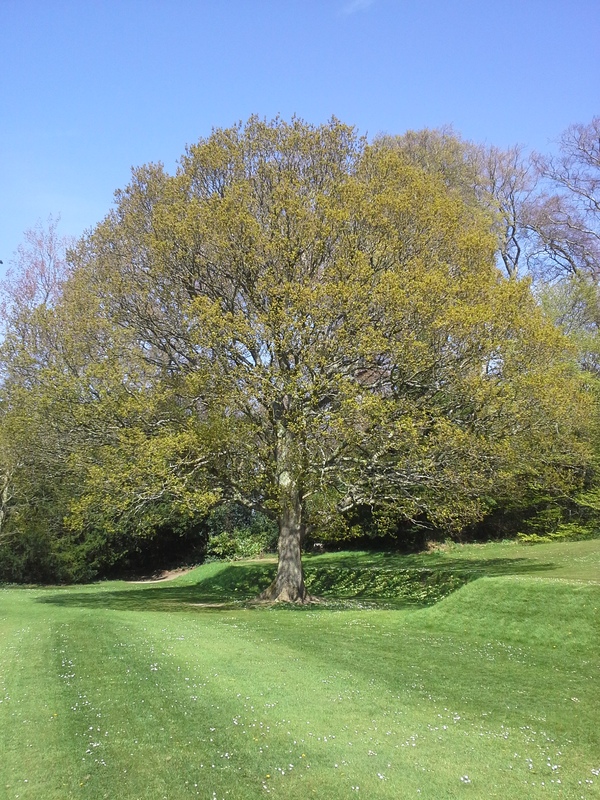 The Oak(of course) the druids would never meet for a ritual without this tree being present. 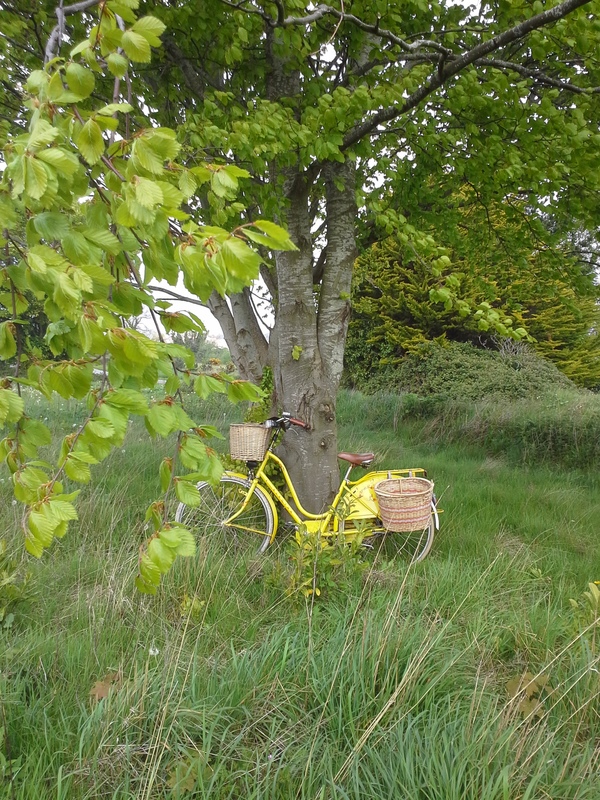 The Hazel…..WB Yeats wrote this beautiful poem about the Hazel. If outside and in need of protection quickly draw a circle around yourself with a hazel stick and you will be safe. Of course Hazel nuts fed the salmon of knowledge of which the story of Fionn mac Comhaill.is about..translated as the blond son of Hazel, how we enjoyed this story when we were young (see below). 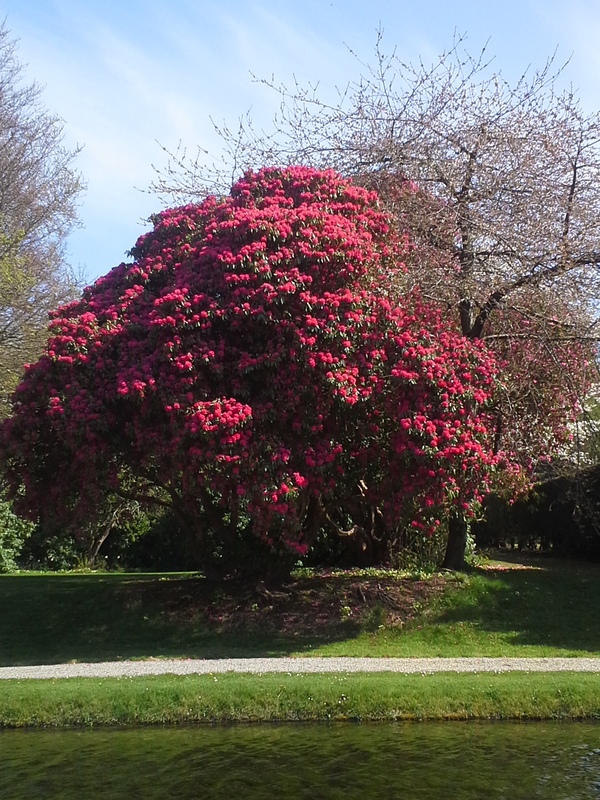 The Rowan…A Rowan staff is said to protect travellers during night time wandering. We are told it is unwise to aim it towards a specific person as that would violate the spell. Seemingly they must come of their own free will…….. 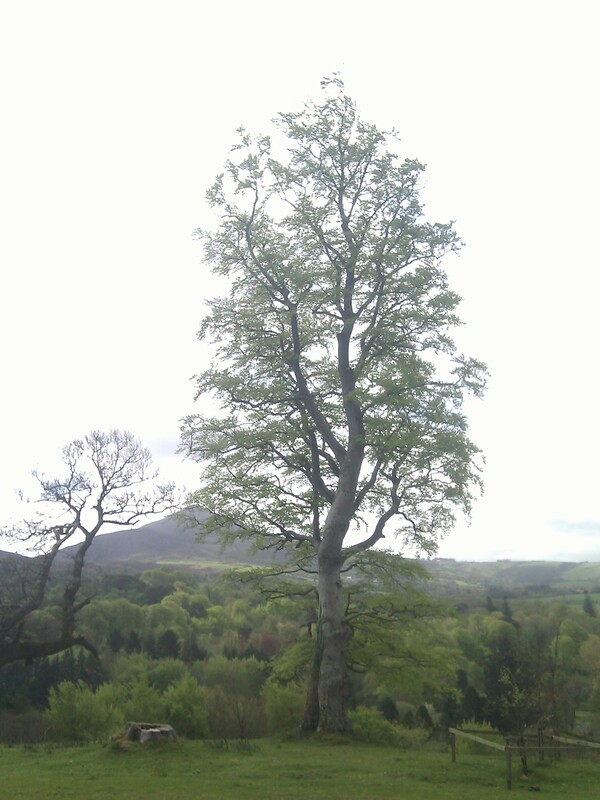 The Alder…..Essence of Alder is invigorating and also helps reduce nervousness and anxiety. 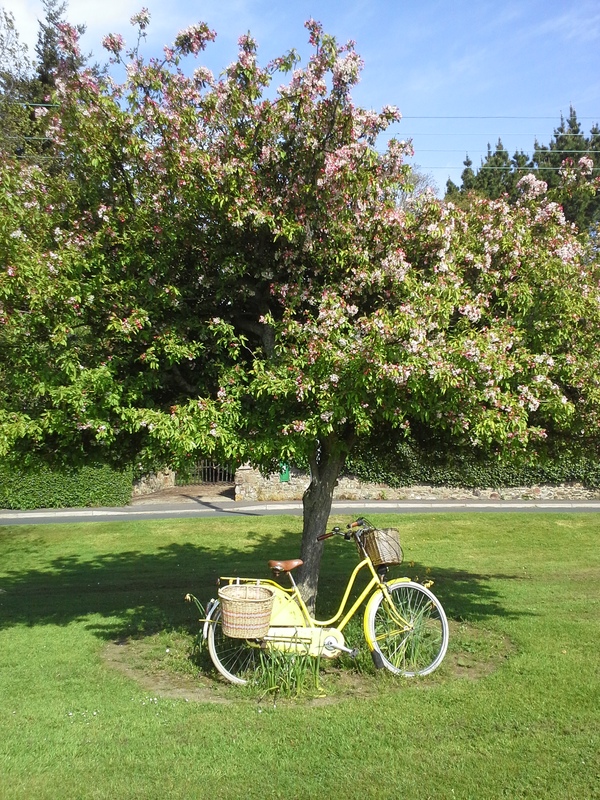 The Elder….my favourite tree , I love to make elderflower fritters from its flowers. Make a simple batter with one egg, i cup ice cold sparkling water , 3/4 cup of plain flower and pinch of soda bicarbonate, beaten together until smooth. Just do two or three at a time and let the oil reheat between each batch. As they float to the top, use the stalk to lift them out. Place on a paper towel then transfer to plate and sprinkle with some sugar, eat straight away. I don’t have any photo yet as they won’t flower till June . The Holly, with its beautiful white wood. 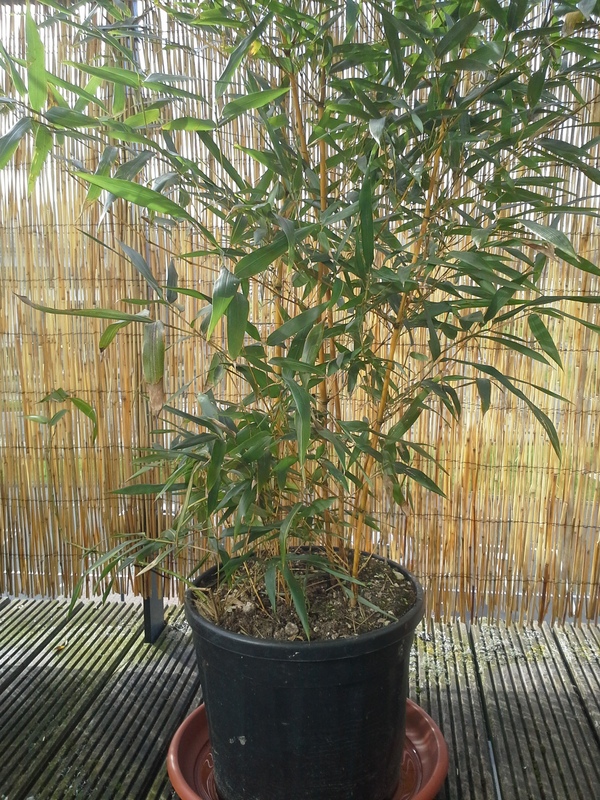 The Willow,….Hopefully tomorrow I will have good new’s. and will go and untie my knot in the willow sapling and leave a gift. It is said that when they are around the wind whips up and the sense in the air is that of a thousand humming bee’s. Well I think I have inundated you enough with tree’s. 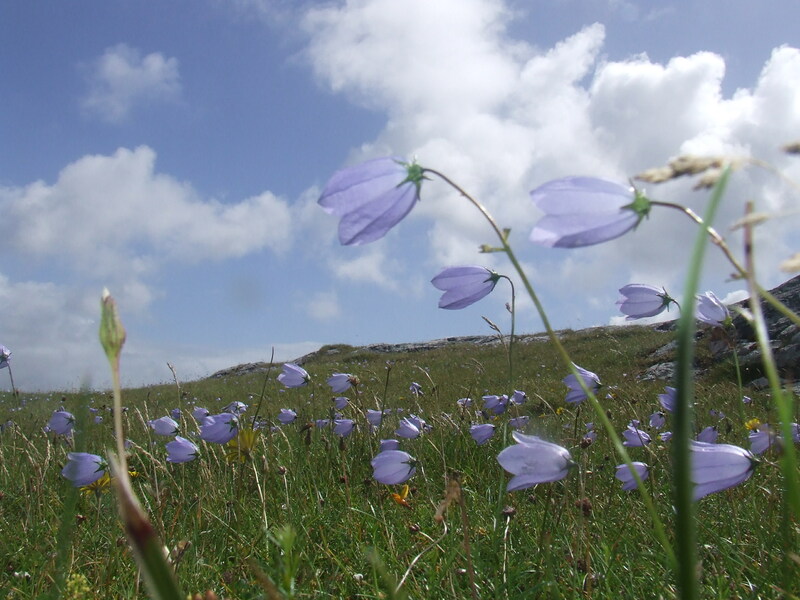 And as tomorrow is La Bealtaine and I have to be up before the dawn to pick wild flowers to strew across my lintel and protect for the year and welcome in the summer. I will bid you good night . Trying my hand at Haiku. 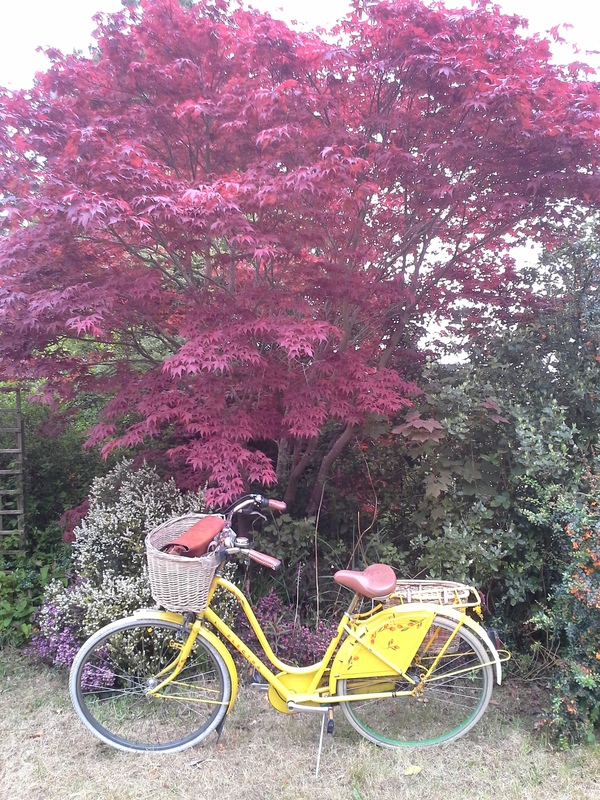 Haiku, nature, the yellow bike, tree's. Spade, hoe and rake anxiously awaiting. Haiku (according to Wikipedia)is a very short form of Japanese poetry typically characterized by three qualities. 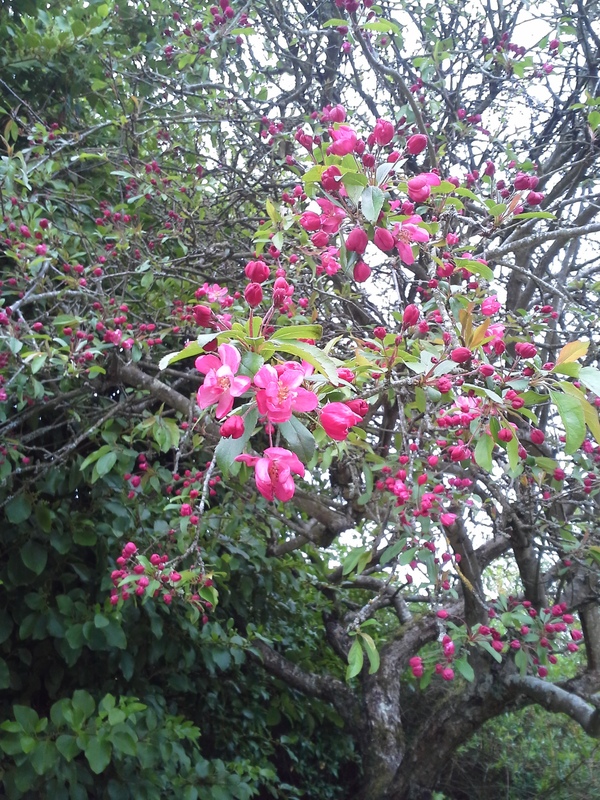 The essence of Haiku is ‘cutting’ (kiri) this is often represented by the juxtaposition of two images or idea’s and a ‘cutting’ word between them, a kind of verbal punctuation mark which signals the moment of separation and colours the manner in which the juxtaposed elements are related. As you can see, my attempt is far from perfect, in fact it doesn’t even come any where near the beautiful allusionally evocative nature associated traditional Haiku’s. BUT Like any stubborn individual I will persevere. but oh how warm the sun is on my back. to take this way to mass. And high over head a hawk watches. 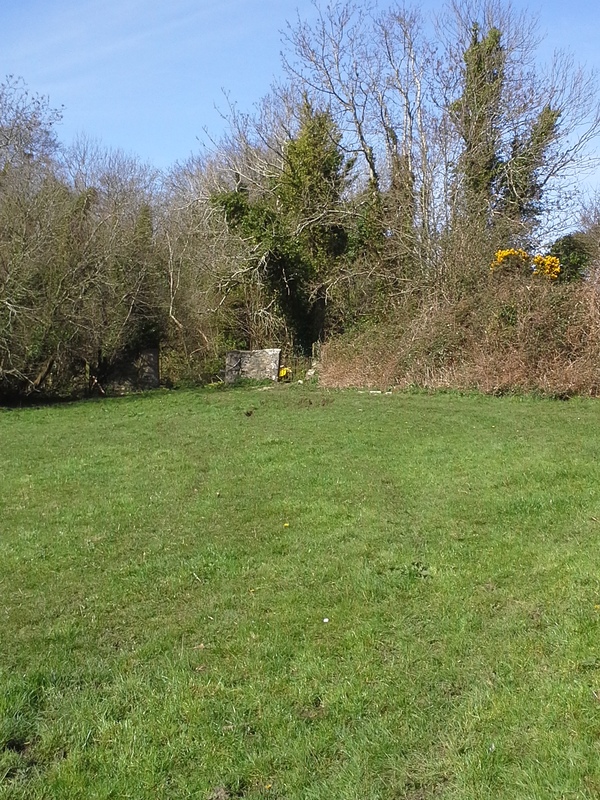 but my dignity and a patch of nettles. we make our way home happily. what else should one do but rest a while. 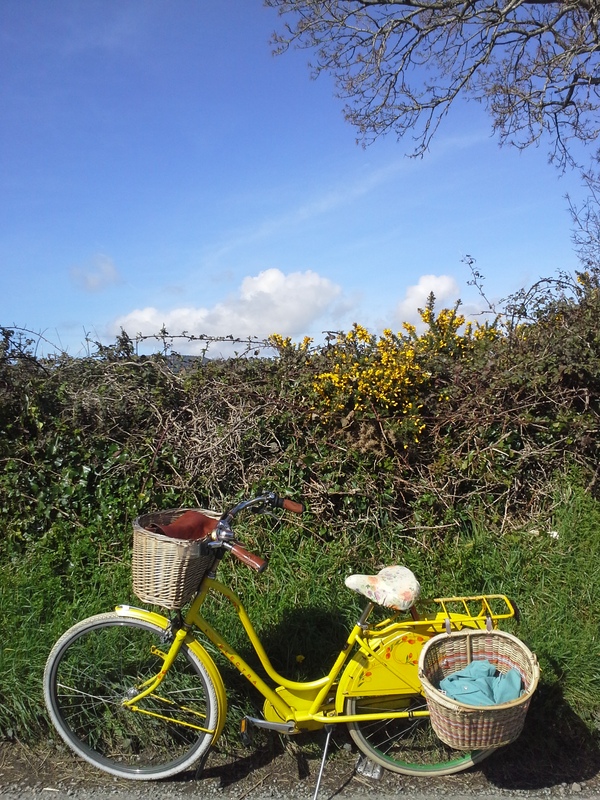 foraging, goosegrass, gorse flowers, nettles, sancerre, the yellow bicycle, violets, wild flower fritters. In my opinion nothing tastes nicer on a fine spring evening than a plate of fabulous pan fried wild foraged fritters. A bit of a mouthful you might say. 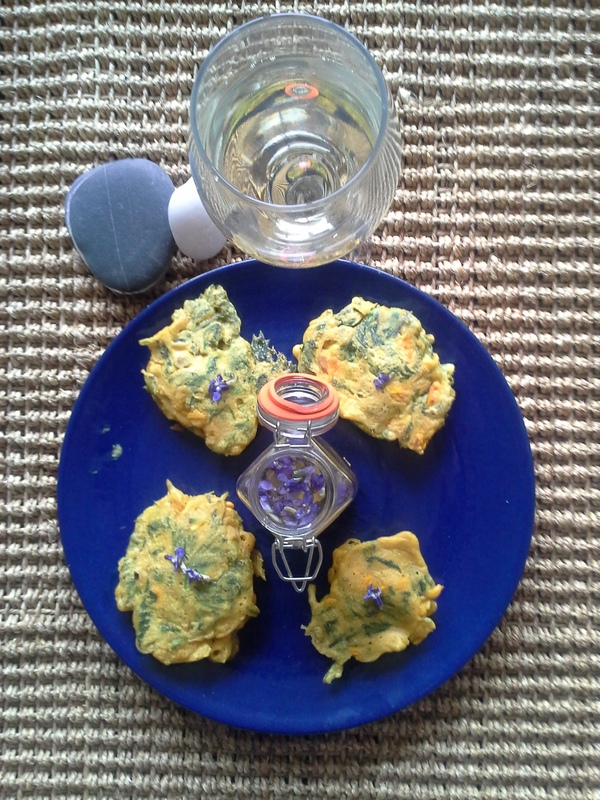 But what if I added, fritter’s made of nettle, goose grass and gorse flower with violet honey? Would that tickle your taste buds? Oh and washed down with some cold Sancerre. A meal fit for a king I hope you agree. Because that’s the plan for this evenings supper. But first to gather the ingredients. Best pick while the morning dew is still on the leaves. 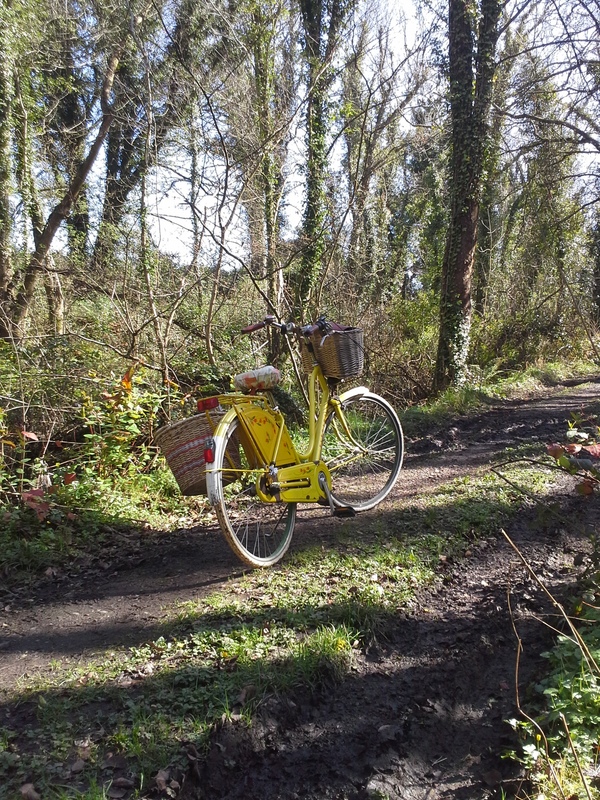 ‘We are going foraging’ I tell the yellow bicycle, busily gathering up some bags and bowl. She doesn’t reply. She is just a bicycle after all. We head out the door. 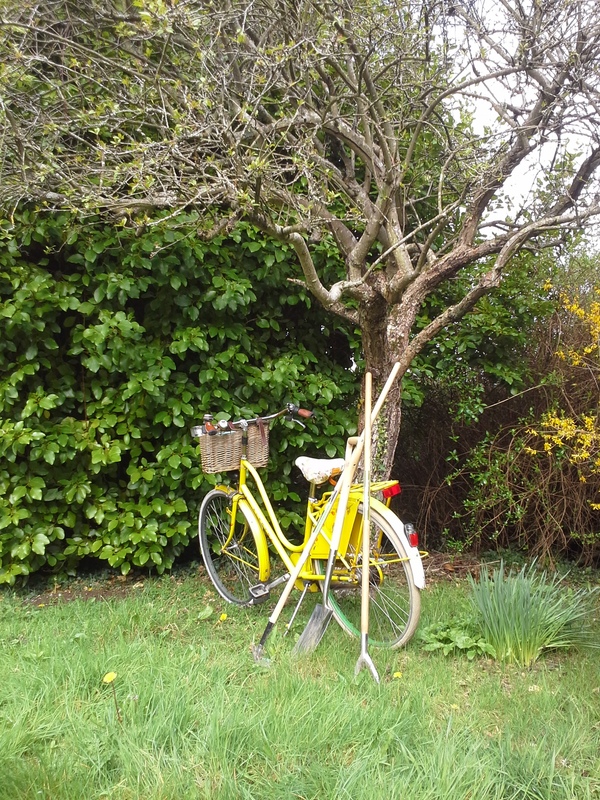 I was about to tell the purple bicycle who is still snoozing, to mind the house, to not let the bamboo in, to not forget to water the yucca. But I catch myself in time. Sometimes I forget my bicycles are not human. 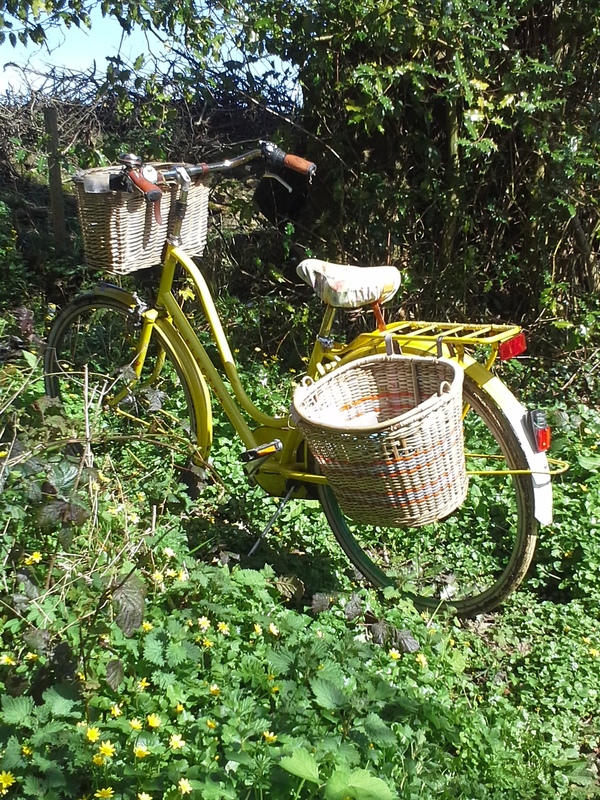 I do see the yellow bicycle as my sort of magic carpet though. 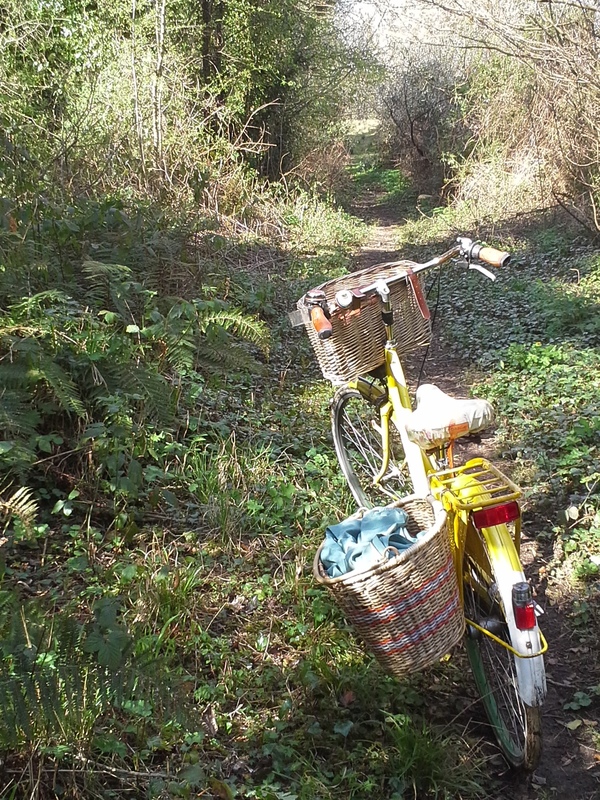 And this morning as I sit on the saddle and say ” take me foraging” I see no differently. 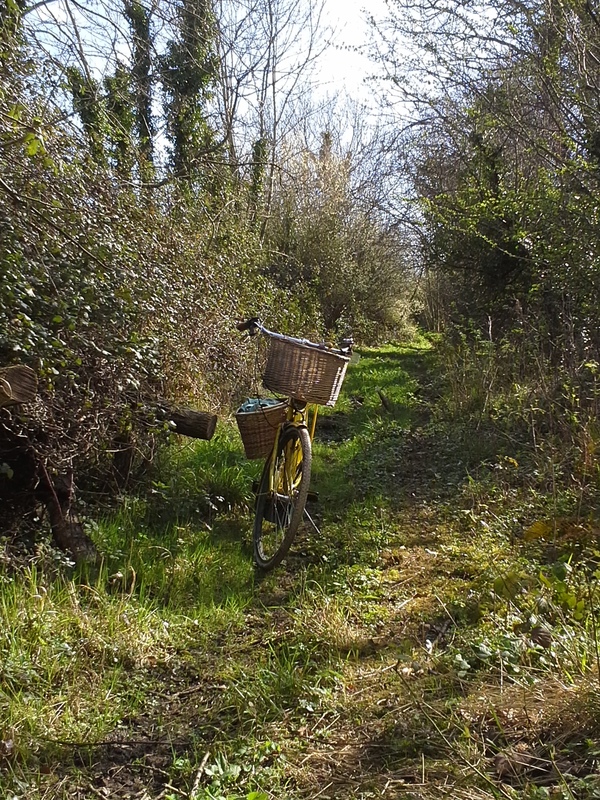 There is a designated cycle path along the road where I live which is truly wonderful. 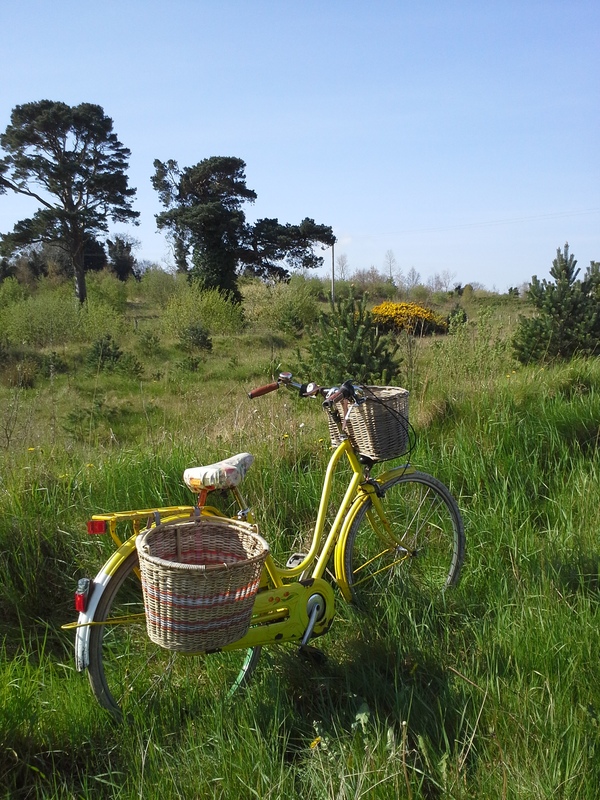 I can pedal along quite safely on the busy dual carriageway looking to the sea on my left and the fields of gorse to my right. I often see racing cyclists still using the dual carriage way and cycling two abreast , causing motorists to become irritated. But maybe they are unaware of the cycle path. 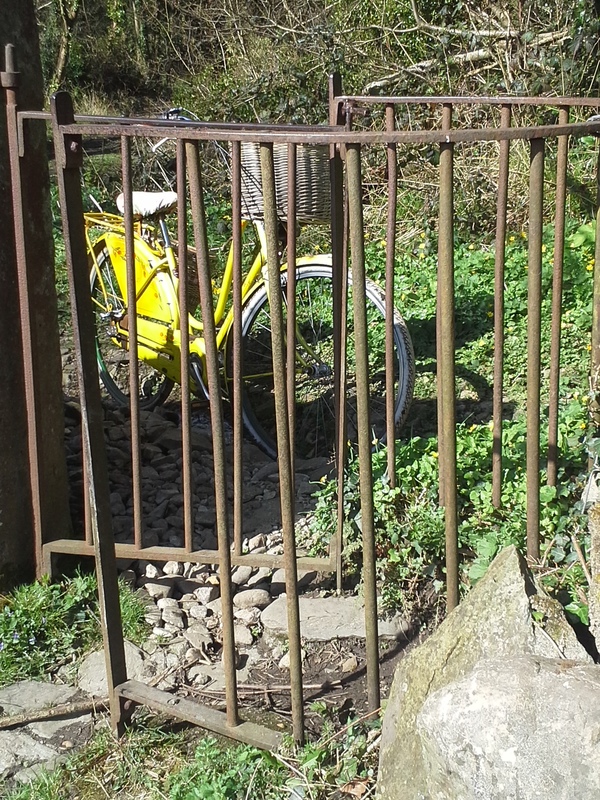 Maybe because, mostly they have their heads down between the handle bars for a good view of tarmacadam and they just don’t see these lovely paths built for their and my benefit. We get up the hill in first gear (the yellow bicycle has three) which I am proud of as we don’t always make it and turn left at the roundabout onto a single lane road, then right onto an even smaller road , a road with no white line in the centre. A wiggly windy ‘my kind’ of road with a few hill’s and little traffic. 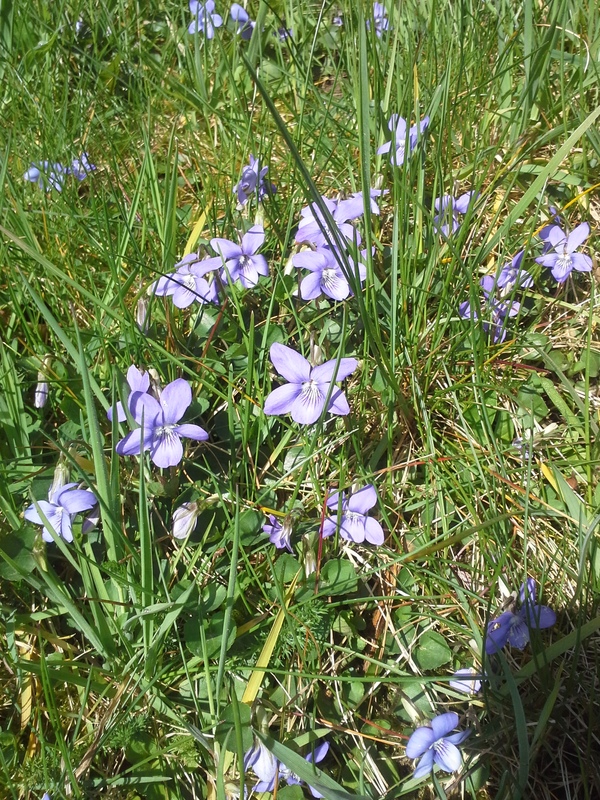 One of the hills proves too steep, which I am happy about, because when I get off to walk I notice a carpet of violets on a sunny bank. I take out a bowl and start to pick. 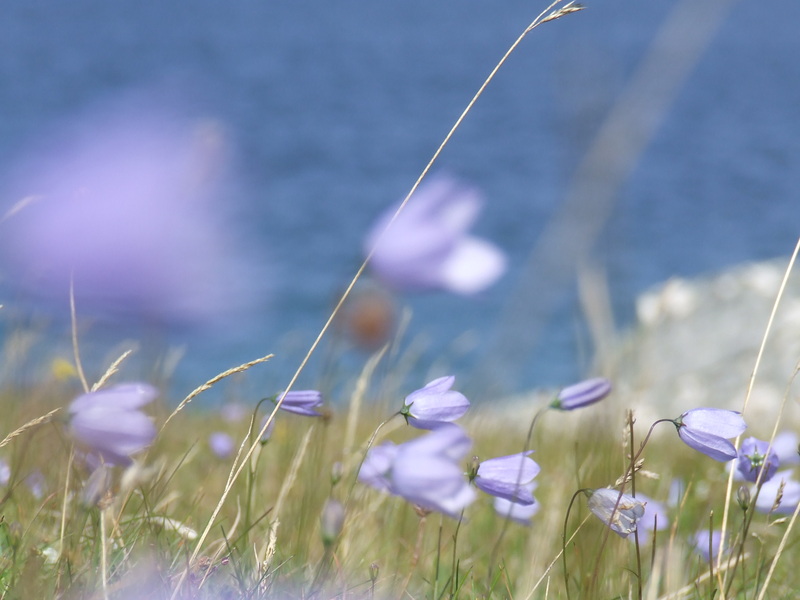 Now normally I never forage along a roadside, but violet’s of such quality are hard to come by, plus no car has passed me since I turned onto this road and the grassy bank is high and away from the tarmac. 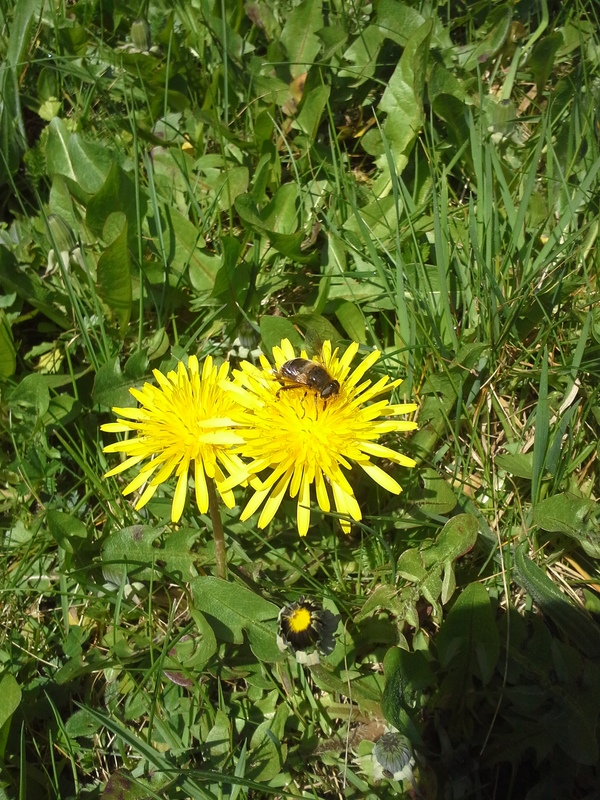 Within minutes I have gathered enough and still there is an endless supply left for the small honey bee that has become my companion (though he appears more interested in a nearby dandelion). At the bottom of the next hill I hear the sound of running water. A small stream is disappearing under a stone bridge. I stop to look over the bridge and notice a locked farm gate with a pedestrian gate at the side. It’s one of those gates which open half way to let you half way through and then when you shut it, it lets you through the rest of the way. All very well for a person but not made to fit a bicycle. 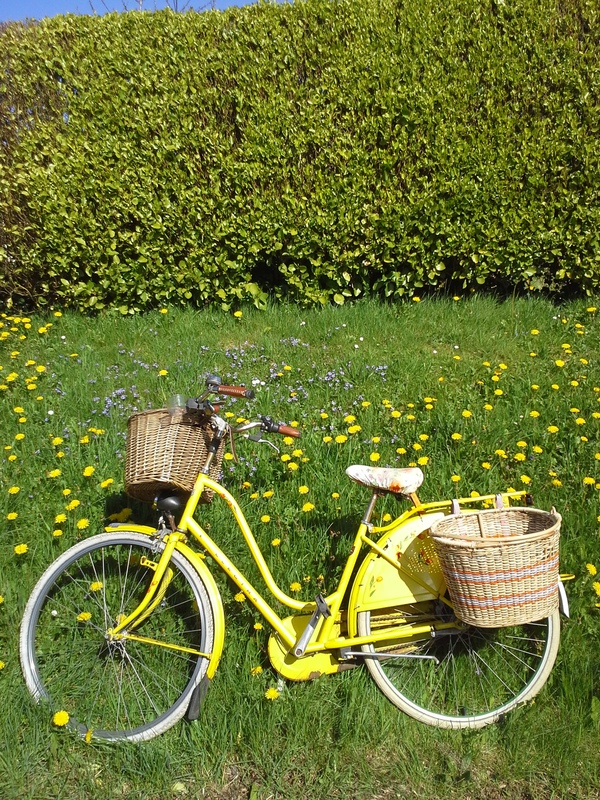 So its off with the baskets and I lift the heavy yellow ticklish bike and do a sort of hip wiggling manoeuvre and we’re through. 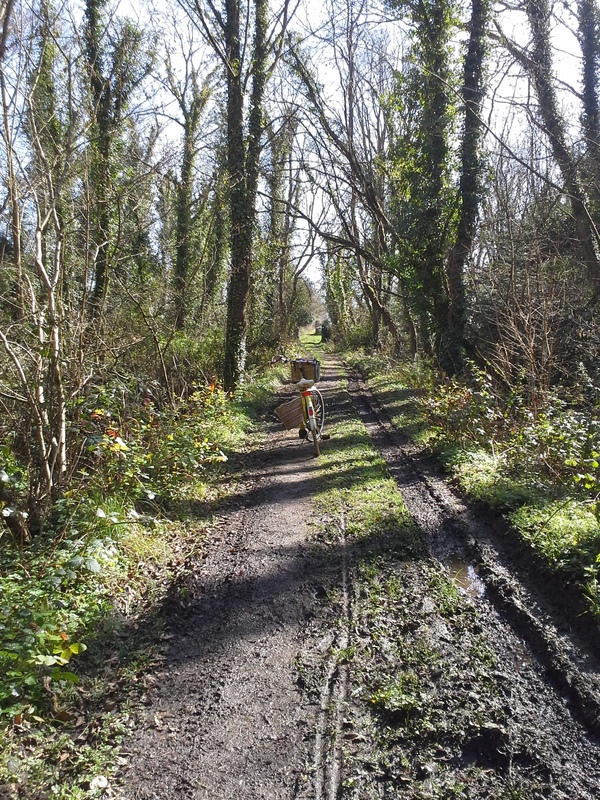 The lane way we are on now is muddy and tree lined and runs along side the stream. The noise of car’s on the disant dual carriage way fades and the noise of bird song and the running of water takes over. 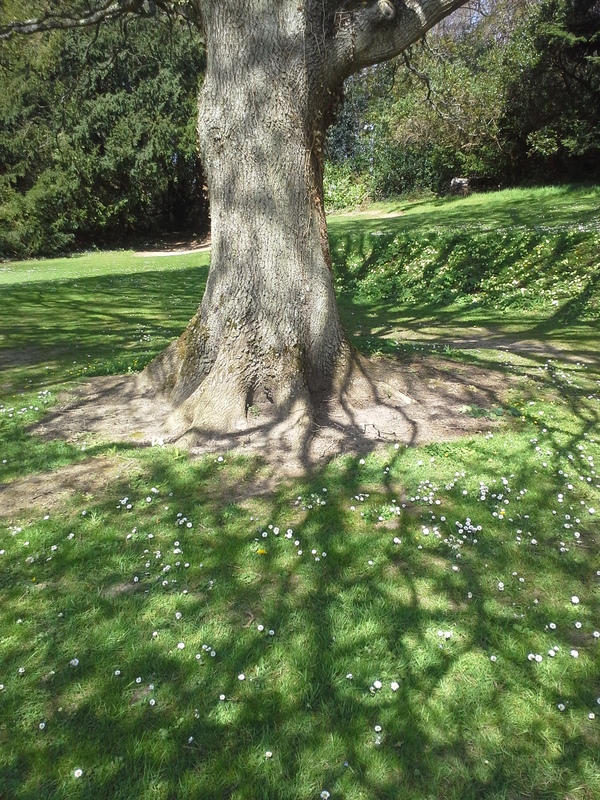 The sun is glinting on leaves and throwing long shadows across our path. 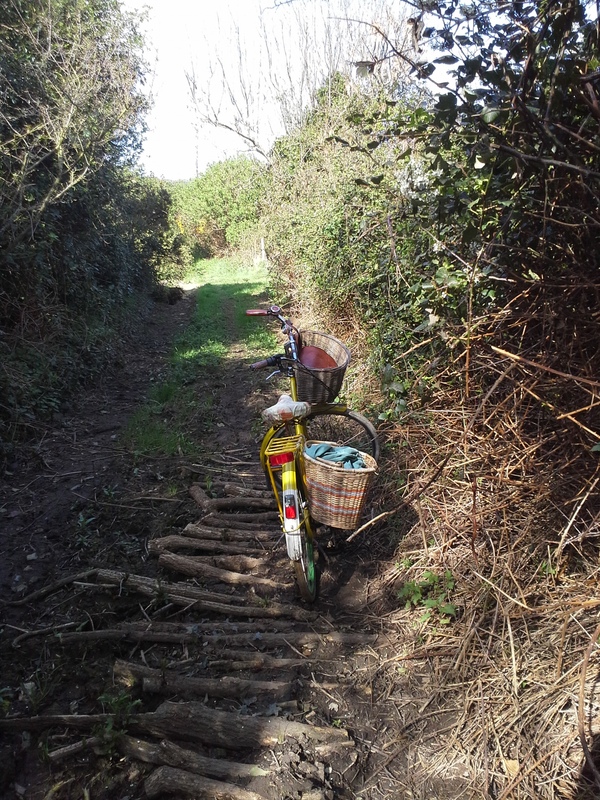 Its a gentle calm place and I would have been happy to stay on it forever and just keep slowly pedalling but soon we come to a second gate and here the lane ends and opens out into a large field. 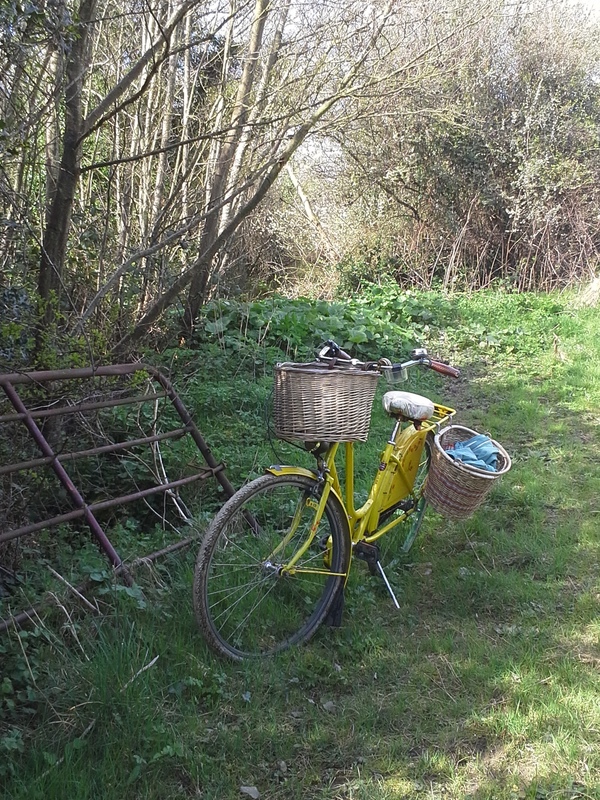 This time the gate proved too high for me to lift the yellow bike over so I parked her among a nice bunch of cheery celandine, went through alone and headed off on foot. 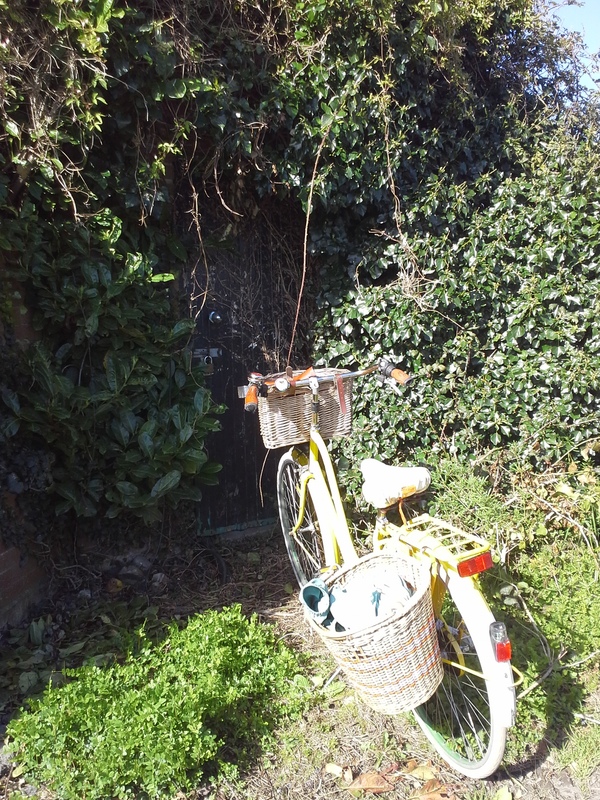 Looking back I could see the yellow bike blinking nervously in the sunlight behind the gate, trying to be brave. I may seem cruel as I know her imagination can run amok and she begins to see all sort’s of monsters and other faerie like thing’s (even though I repeatedly tell her that tree monster’s and dragon’s just don’t exist). 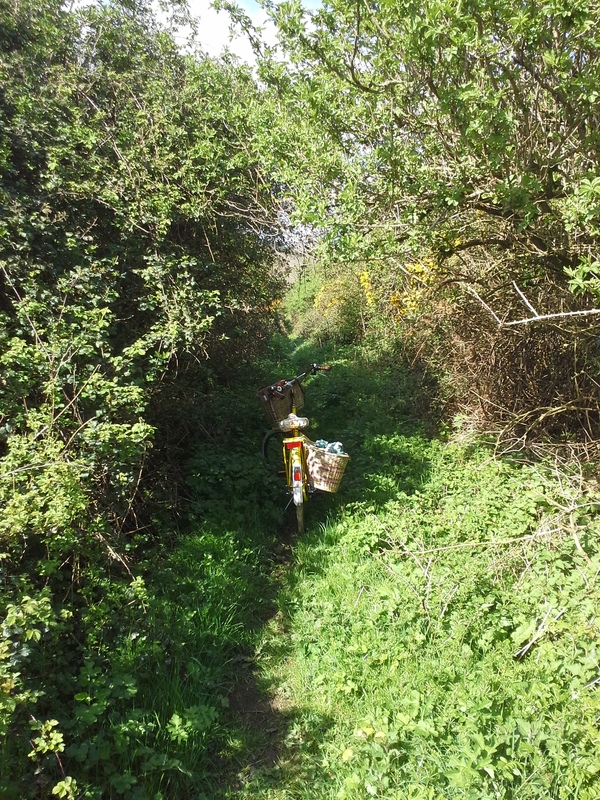 ‘Ring your bell if your worried’ I call to her, checking first to make sure there are no other humans within earshot(I wouldn’t like to be thought of as odd) I spy a beautiful clump of nettles! I would lose count if I were to list them all. So instead please read below. 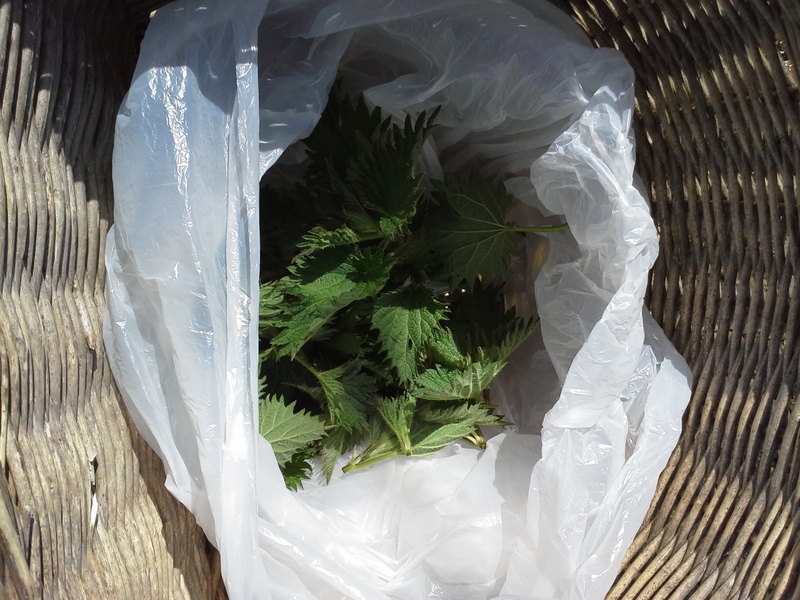 There is an art to picking nettles by bare hand. It is not for the faint hearted and you will not be seen to be a wimp if you resort to gloves or a plastic bag with your hand in it. The trick is in the method and you have to be confident. Firstly, where you pick from the plant will depend on what you are making. I use the tip i.e. the top three young leaves for tissane’s, soups and colcannon. I use the larger leaves from further down the stem for whole leaf tempura. Once you have decided which you are going for just grasp it very firmly and with a squeezing action between your thumb and first finger. If you do this firmly enough I promise it won’t sting and just mind you don’t brush off any other nettles. Behind the nettles I spy some juicy goose grass. 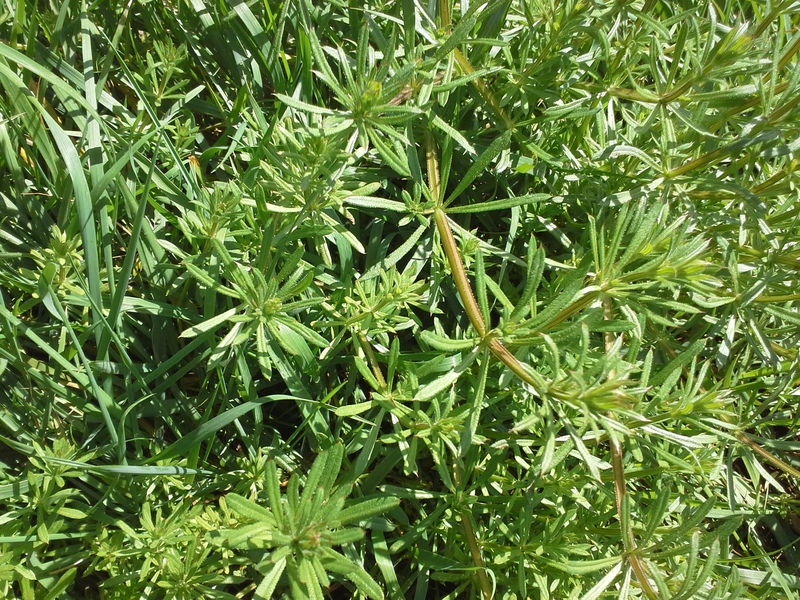 Goose grass also has amazing health giving properties but again don’t take my word for it . http://www.herbalextractsplus.com/goose-grass.html. Now goose grass is easy to pick but for the tastiest parts just pick the top inch or so as lower than that it becomes stringy. I sometimes pick longer pieces and trim when I get home. 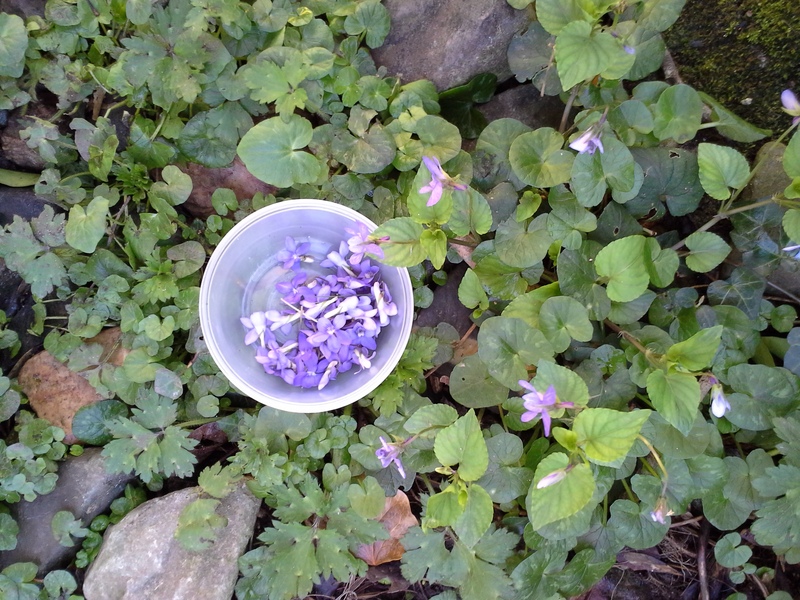 I gather a good handful and suddenly I spy some more violets. I sigh blissfully and stoop to smell them. I’m humming happily to myself now , doing what I love best, being near to the ground and nature. 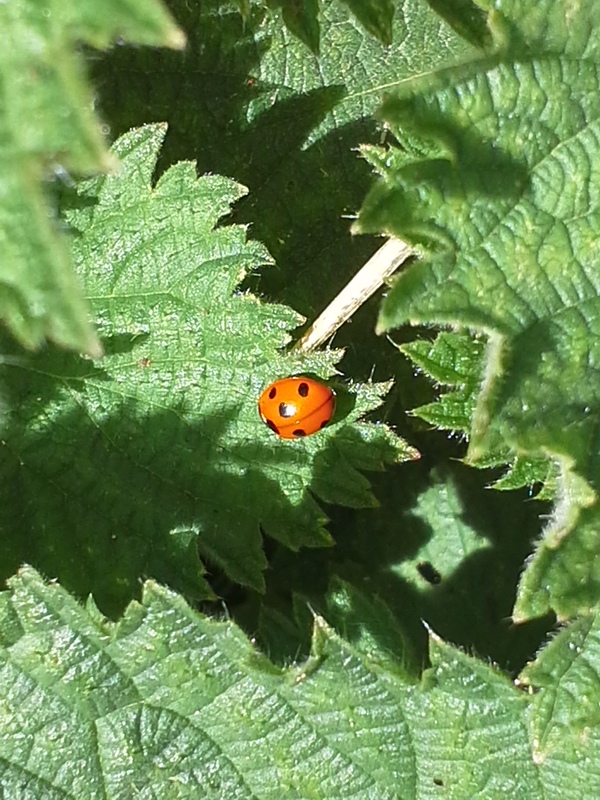 I get distracted by a ladybird on a nettle leaf. ‘How come you are not getting stung little ladybird’ but she ignores me and carry’s on with her business. The sun is higher now and I hurry along to pick my final ingredient. 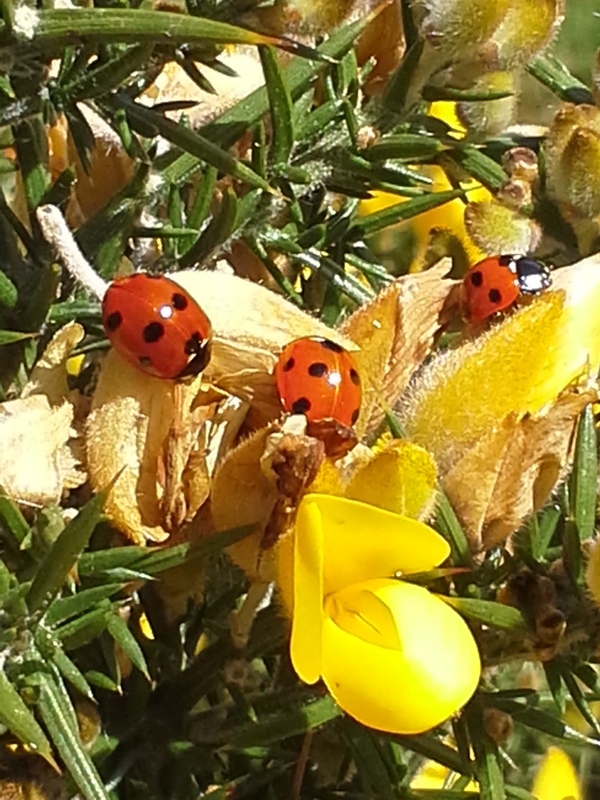 Gorse flower’s! Why am I not surprised to learn that the health benefit of this sunny yellow flower, smelling of coconut, might take the form in the lifting of one’s spirits. I start to pick a happy bowl and again I am surprised by more ladybirds. Joyful little one’s, munching away at the aphid’s. I pick carefully around them. Soon I have a bowlful. The yellow colour is striking against the blue of the violets. 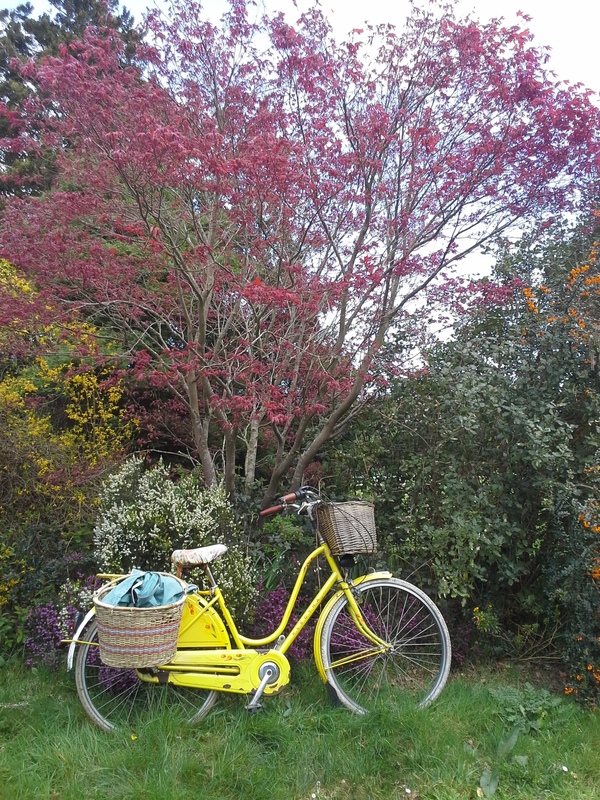 I make a fuss of the yellow bicycle and promise as a reward that we will cycle back by the garden centre and see has the Cherry blossom begun to bloom yet. Back along the muddy path we go to the end of the lane. 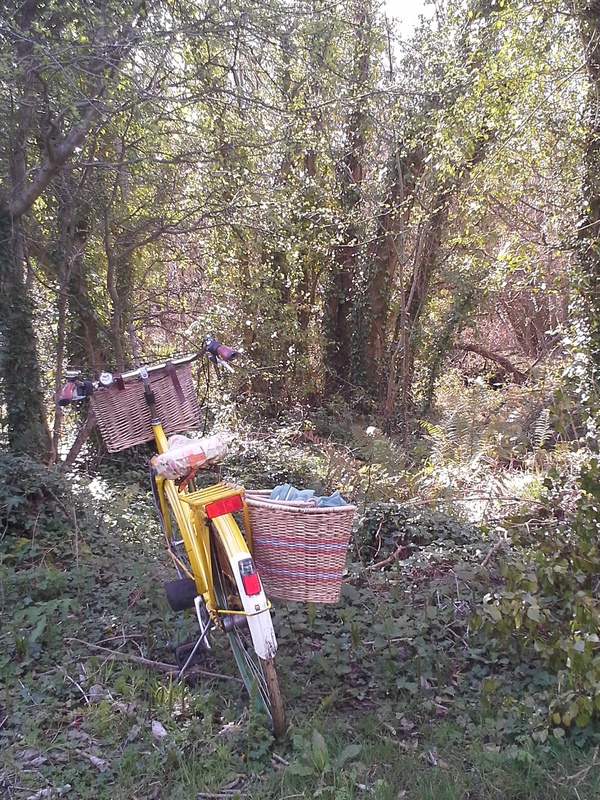 Refastening the basket I inhale the heady scent of violets and gorse blossom. 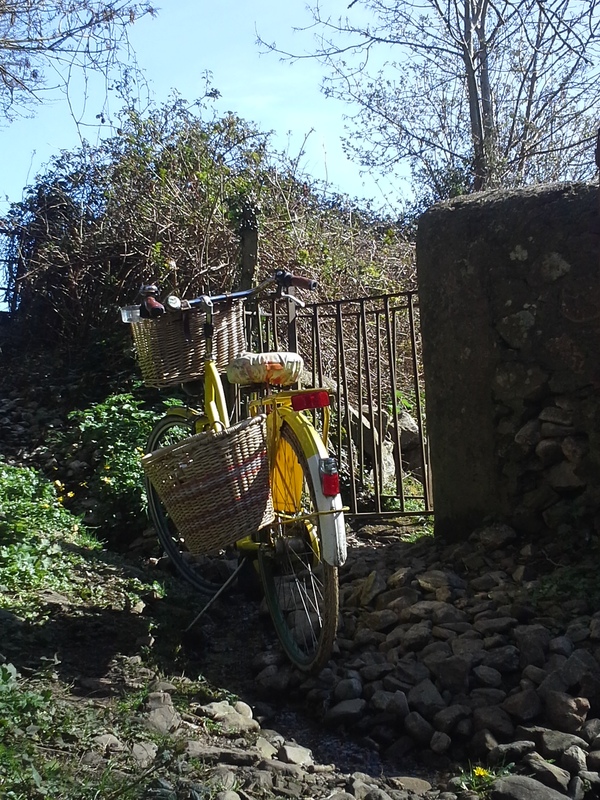 We sail around the corner, ignoring a small dog that shoots out of a gate and snaps at our wheels. We are going so fast now he hasn’t a hope in catching us . And then we slow down…. WOW…….. we sigh…..and reverently, slowly, gently, push forward to take a closer look . festooned in a thousand snow flower’s…. Magnificent in her white frothy dress. 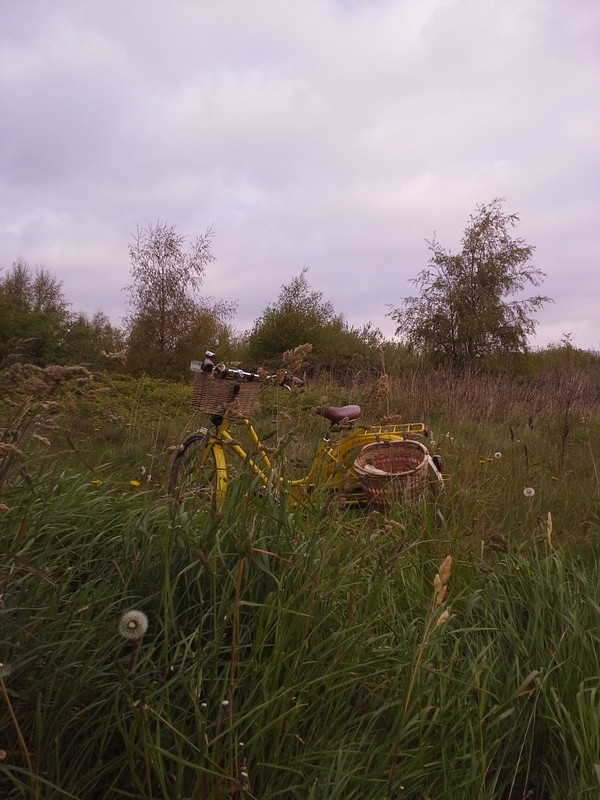 I know what the yellow bicycle is wishing for. 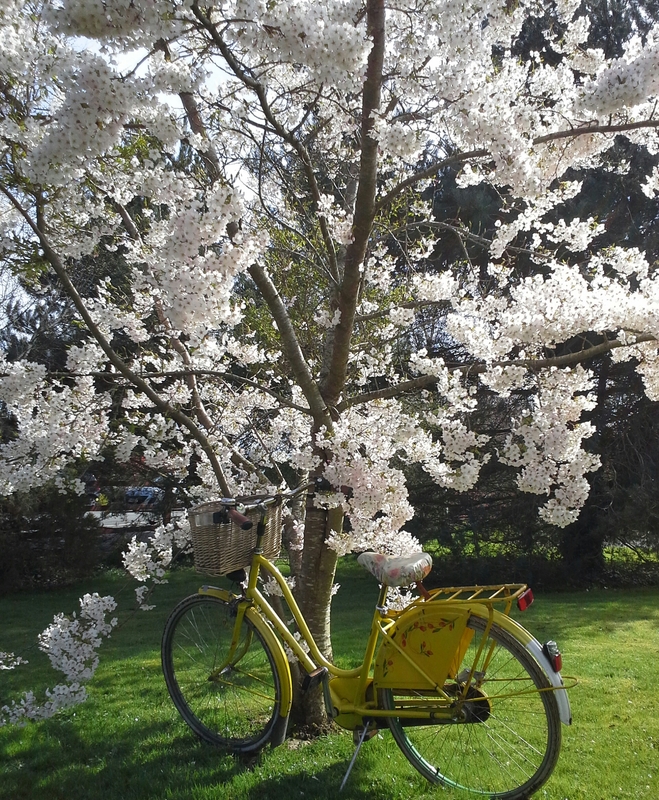 I gently wheel her until she is standing under the white cherry blossoms. We head home after our long day to make what we had planned. 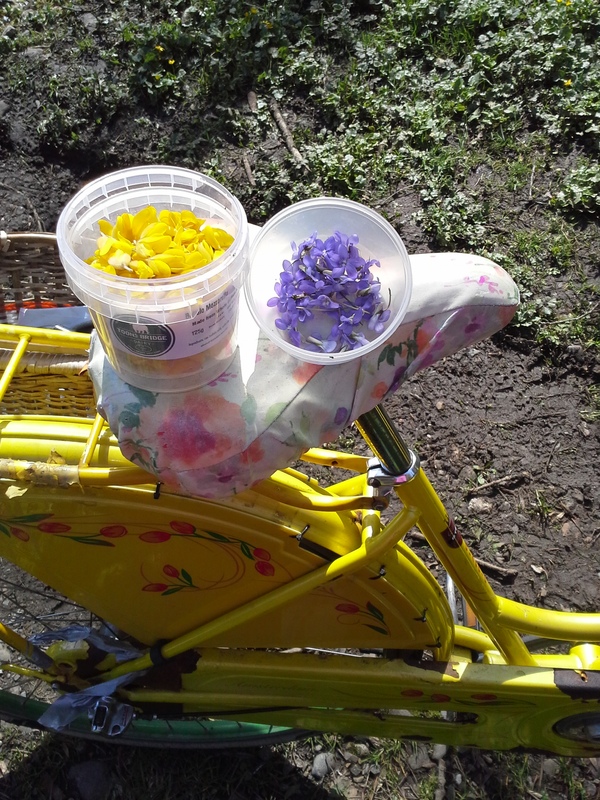 Our delicious nettle , goose grass , and gorse flower fritter’s with violet honey and here is how we made them….. I handful of goose grass. I handful of gorse flowers. I cup self raising flower. I cup of chilled sparkling water. Method…. 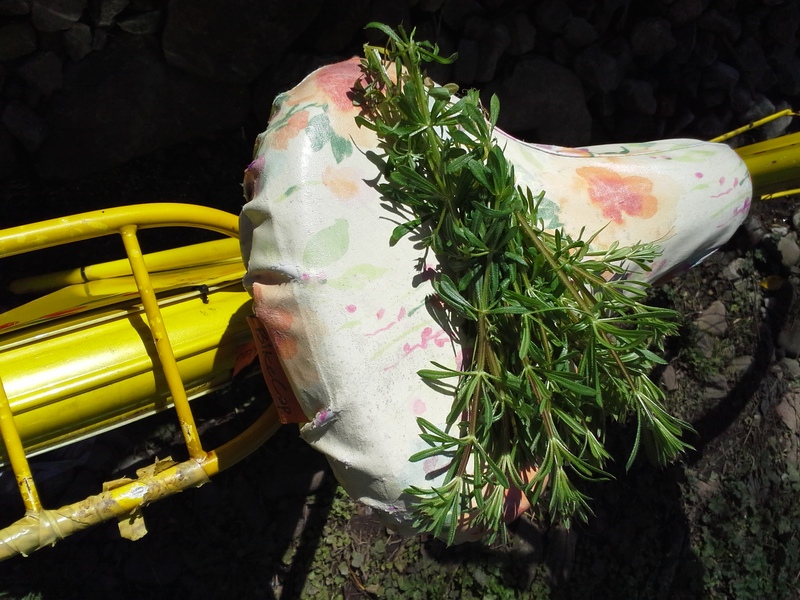 Steam the nettles and goose grass until soft and well wilted allow to cool then chop into inch size pieces. Mix together the flour , turmeric and salt in a bowl. Add cooled steamed nettles and goose grass and fold in. Fold in raw gorse flower’s. Add spoonfuls of mixture and flatten slightly. Cook on one side and when well brown turn and cook on other side. Add a piece of goats cheese and let melt if lucky (goats can be found lurking around foraging area’s but maybe hard to catch and milk) please don’t feel you are cheating if you buy some goats cheese on your way home. Place browned and crispy fritters on plate and serve with small dollop of violet honey. To make violet honey…. 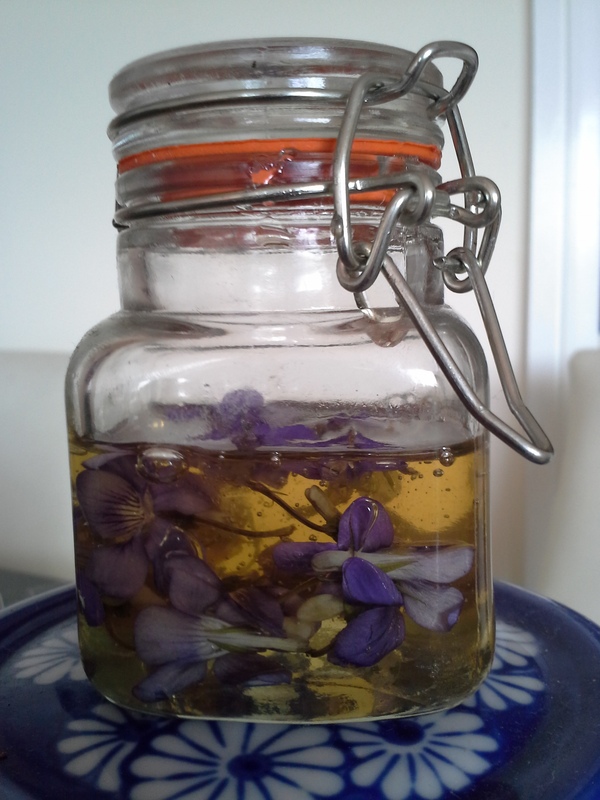 pour honey into small jar and add violets. Your feast should look something like this. I would like to take this opportunity to say I cannot be held responsible for anyone who picks the wrong plant, gets badly stung by nettles, bee’s or wasp’s or gets butted in the behind by an irate goat. 🙂 Enjoy your meal.